Many of those who live in the Czech Republic may tell you that they have met or at least seen someone who is involved in medieval reenactment. From musicians to swordsmen, there is a sizeble group of middle-ages enthusiasts in the country. One group however has taken things to the next level. 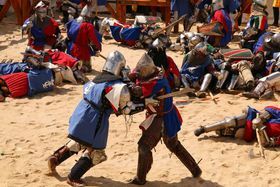 Looking for the real medieval combat experience, a group heralding largely from swordfighters decided to join an increasingly popular sport, which pits fully armoured fighters against each other in competitions resembling medieval tournaments. Photo: archive of Medieval Contact Fighting Sports Club Hidden in an old Žižkov factory building is a small gym. Frequented by both men and women between the ages of 20 to 30 and sporting the standard gym equipment such as dumbbells and mats. 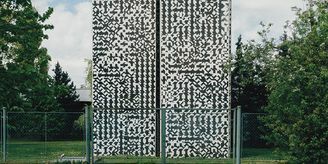 Upon closer scrutiny however, one starts noticing signs that this is no ordinary exercise hall, but rather the training centre of Prague’s Medieval Contact Fighting Sports Club [Sportovní klub Středověkého Kontaktního Boje]. A travel bag near the windows reveals what is clearly a breastplate, while next to it lie a shield and helmet. The training gear also starts to reveal its purpose. Hung on one of the benches is a vest filled with weights, obviously intended for getting used to wearing the armour and placed in rows near the entrance are dozens of trophies. Some of the members, dressed in standard gym clothing, start explaining which ones they are most proud of. Although the team has stood on the podium many times in its six year history, the most revered cup, is not for a victory. Rather, it is for ‘Best Newcomer‘ from a tournament in Russia. The respect of these Czech medieval fighters to their Russian and Ukrainian counterparts is obvious and for understandable reasons. 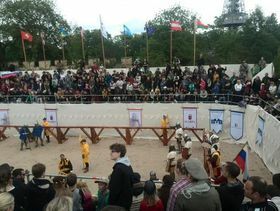 The two East European teams place regularly in the top podium spots during the Historical Medieval Battle world championships, known as the ‘Battle of the Nations‘, and the region they come from is seen as the father of the sport itself, which started emerging sometime in the late 1990s. Suddenly one of the club’s founders, Tomáš Gajdošík, walks in, as the others start warming up, he explains what training usually looks like. The wrestling focus makes sense. Despite the presence of blunt but authentic medieval weapon replicas, ranging from falchions to axes, anyone who has ever seen an HMB battle either in real life or through one of the many YouTube videos, knows that these fights often descend into desperate wrestling contests. As heavy metal music accompanies the training, Mr. Gajdošík takes me outside to get me better acquainted with the armour HMB fighters use. 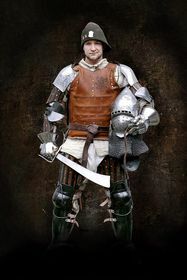 Tomáš Gajdošík, photo: archive of Medieval Contact Fighting Sports Club I am wearing a medieval helmet right now. Is this a bascinet from the 15th century, or when? So I would fit into the Wars of the Roses? It’s bearable. Kind of like falling when you’re skiing. I have to say the visibility is actually much better than I had thought. These helmets are reputed to be much less visible. What are your impressions? Or does it get worse? The complete armour suit is worn over gambeson and trousers just as a medieval knights would. Although mail is not worn underneath and the modern jockstrap replaces the old codpiece. While training was in progress, I managed to steal some of the modern knights. One of them, is a girl called Pamela. I asked her if it was normal to see women partake in these medieval fights. Is that why you chose to do it? 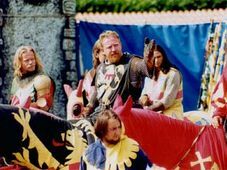 Are there any other medieval themed activities you partake in? Photo: archive of Medieval Contact Fighting Sports Club Do you have your own suit of armour? Is there something you’d tell people who are thinking of trying this sport out? “The best experience I could tell them is that you find a really great family in this sport. The people are great and it is something that will change your life if you really take the hang of it and want to commit." Pamela’s story of getting into HMB through re-enactment and swordfighting school seemed like the norm rather than the exception, as the two other members I interviewed had similar stories. “I was doing historical re-enactment and we were at a tournament in Poland, the Battle of Grunwald – one of the biggest tournament re-enactments, with about 1000 fighters. There was a Historical Medieval Battle tournament there. I think it was in 2010. I saw it with some friends and we thought: This sounds interesting. There were a few people in the Czech Republic, who were looking for information about it and how to train. So we started training and about two years ago we founded our club and entered the ‘Battle of the Nations’ tournament." From the information I gathered, it was clear that many members got into the sport after being involved in some other medieval related activity. 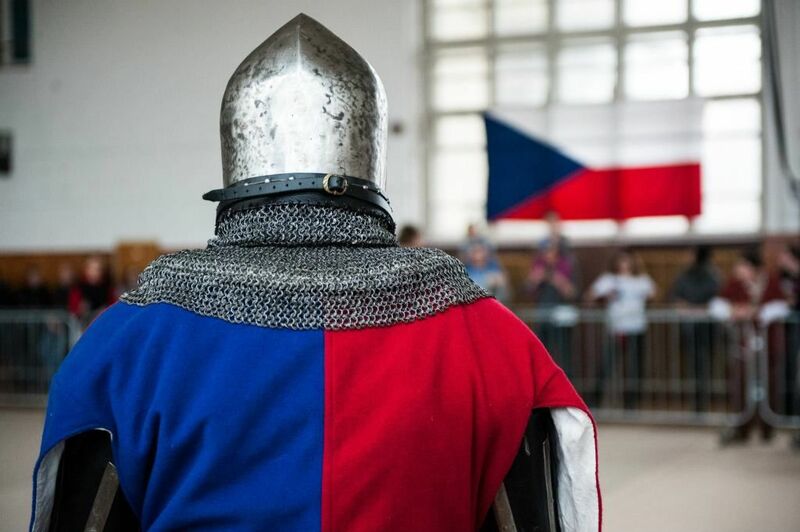 Re-enacting and learning the skills of the period is quite a popular hobby for many Czechs, with many sword fighting schools across the country and various medieval musical bands as well. With the training session over, Mr. Gajdošík joined us in the studio, where I asked him about why he thinks this era is so popular in Czech Republic today. Photo: archive of Medieval Contact Fighting Sports Club How many member countries currently take part in HMB and ‘Battle of the Nations’? You’ve mentioned teams from Africa, Japan, etc. Do these guys wear medieval style armour or do you end up with samurais fighting knights? How dangerous do you think HMB fighting is? Is it something that people should think about twice before joining, or are you simply very well protected? You’ve said many times that people should join. How long does it take for a person to go from junior member to man-at-arms ready for battle? Is there some required training period? 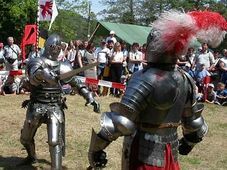 From talking to Mr. Gajdošík and his fellow men-at-arms, it was clear that the most fantastic experience are the HMB tournaments themselves, which attempt to mirror the tournaments of the era. 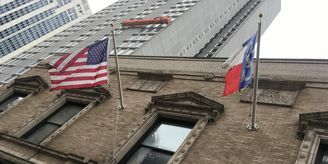 The annual Battle of the Nations seems to tower above all of them. Members' faces would automatically lighten up when describing it. I asked what it is about the tournament that makes it just so much fun. Battle of Nations, photo: Martin Karlík / Czech Radio “Well I would start with our normal year. We have many tournaments all around Europe as well as in the Czech Republic during the year and then there are a few tournaments that we call “eliminations”. It means that the country’s teams are eliminating each other, because just three teams of five can go to the ‘Battle of the Nations’. Only one pro-fighter or one duellist can go and only one women's team can go to the ‘Battle of the Nations’. So you have to get the best and then those fighters go to the championship. Naturally they try to win everything of course.